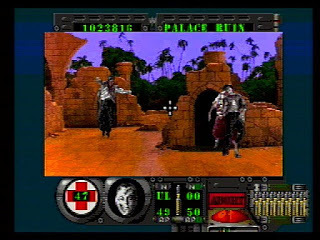 Corpse Killer is a Full Motion Video (FMV) game that was also released on the Sega CD in 1994. Airdropped onto the tropical island of Cay Noir, your mission is to rescue four comrades and stop the evil Dr. Hellman from releasing hordes of zombies onto the world. Your normal gun can be upgraded with powerful armor-piercing or datura-coated bullets (necessary when facing certain zombies), and antidotes can also be obtained to restore your ever-depleting health. The action is repetitive and when you're not watching the endless cut-scenes and looking around the map screen the only thing to do is occasionally take part in a shooting gallery where you blast ridiculous looking zombies as they scale towards you. The on-screen target cursor is unbelievably laggy and inaccurate to the point where luck often replaces skill; in fact, it's so bad that you could be fooled into thinking you have a defective CD! The Sega Menacer light-gun is advertised as being compatible, but seriously, don't bother as it's wildly unreliable and utterly broken. The FMV quality is the worst I've seen in regards to 32X-CD games with dull, grainy backgrounds, heavily pixelated zombies and an extremely low frame-rate. To top things off, the audio constantly cuts in-and-out while you're firing, and the same SFX plays ad nauseam after you've killed a zombie. The gameplay is not without some merits though, and I do like the non-linear approach that allows you to choose where to battle next from a map screen. Also, you can save your progress at any point, as well as retreating when health / ammo is low, meaning some strategy is involved; it's just a shame that the rest of what's presented here is so unpolished and monotonous. Corpse Killer is a shallow title and the fancy FMV footage is a misguided attempt to fool you into thinking its gameplay is more substantial than it really is. After the first ten minutes you've seen and experienced pretty much everything it has to offer and there's nothing in the way of variety to keep you coming back. Random trivia: Dr. Hellman was played by Vincent Schiavelli, who also featured in the 1992 Batman Returns movie as the Organ Grinder.